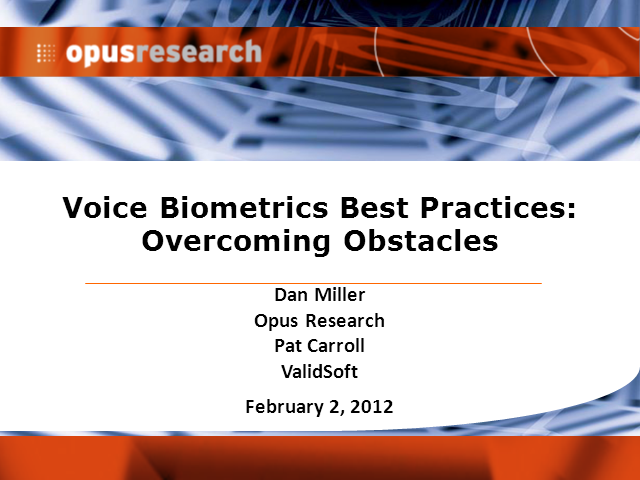 Join two thought leaders in Voice Biometrics and Multi-Factor Authentication as they review lessons learned from over a decade of core technology evolution, solutions definition and real-world implementations of voice biometrics around the world. A recent surge in activity and interest signals a milestone in acceptance and adoption of multifactor authentication technologies. Hear about 'learnings' from deployments (both the successes and the busts) among telecommunications carriers, healthcare providers, financial services companies and large retailers. Then find out why Opus Research is confident that we'Âll see double-digit growth in enrollments and authentications driven by the growth in mobile commerce, increased complexity of password management and a growing concern over identity theft and unauthorized enterprise network access.